One of the more popular slogans on the back of bowling t-shirts is, “Grip it and rip it.” This has become the mindset of pseudo-macho bowlers as well as the thrill of many aspiring youngsters who are enamored by wide arcing explosive strike balls. With all due respect to the limited number of bowlers who successfully employ the “grip it and rip it” method of execution, past records reveal that “strokers” are more successful regarding strike percentages in comparison to power players who resort to overpowering the pins. Essentially we are looking at three different type players…the pure power bowler and the two categories of strokers, the soft medium type and “power” strokers. In bowling vernacular, grip and rip bowlers are products of modern bowling’s most celebrated ripper, Mark Roth. Roth completely dominated the PBA tour utilizing his power-laden release, his five, six or seven-step approach, and his thunderous follow through that sent pins flying in all directions. His unorthodox style, completely void of a smooth-flowing armswing was, at best, jerky and forceful. Nonetheless, Roth delivered one of the most powerful balls in the history of the game and annexed 34 titles. 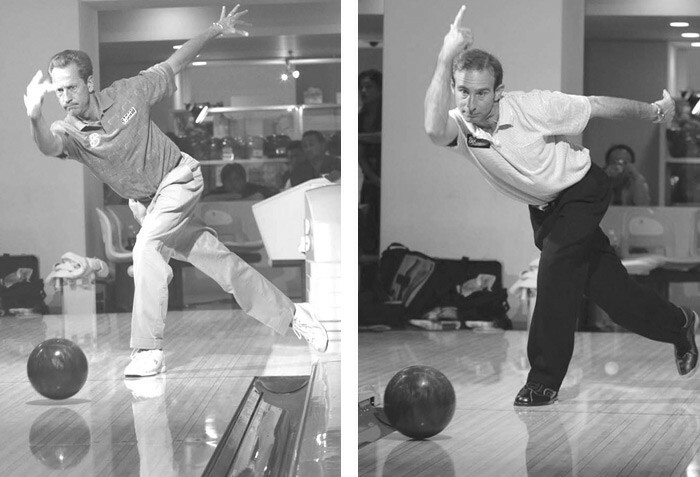 Roth undoubtedly inspired more youngsters to adopt the rip and grip method of execution than any bowler in modern bowling history. Most importantly, however, Roth achieved inordinate revolutions PRIOR to the advent of urethane equipment. Roth’s victories were accomplished with polyester bowling balls. Polyester balls had far less hooking characteristics than modern missiles that have been created from urethane materials for greater traction on the lanes. Yes, Roth threw polyester balls. In fact, those same balls are used by today’s players in tossing straight deliveries at single pin spares, especially 10 pins. These balls are mistakenly referred to as plastic balls. For bowlers and bowling fans who are unfamiliar with proper terms for synthetic materials, it must be noted that ALL bowling ball coverstock materials are technically plastic. Plastic, in relation to bowling ball coverstock materials, are man-made liquid resins from petroleum products that are moldable and shapeable. The first of these products used to replace rubber balls was polyester, followed by urethane, and later improved by applying various additives that added greater friction to the outer surfaces of current bowling balls. Roth was unique in more ways than one. He was deadly accurate and possibly the greatest spare shooter in modern bowling history. He manufactured incredible revolutions, threw very hard and, unlike current power bowlers, he covered far less boards than contemporary power bowlers. Roth set a Tour average of nearly 222 with a polyester ball! Roth’s grip and rip method of execution can best be described as one of exerted force, particularly at the release point. 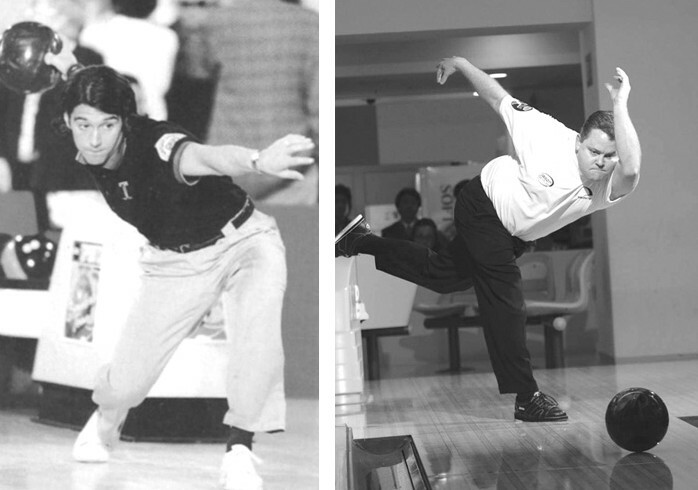 In illustrating true pure power type bowling execution, it goes thus: the forward swing begins with a wide open hand position at the top of the backswing. The thumb is pulled back completely away from the palm with the ring finger at approximately a 12 or 1 o’clock position. (Opposite for lefthanders.) Unlike a stroker-type bowler who allows the ball to fall from gravity, the grip and rip bowler pulls the ball into the forward swing with an open hand, all the way down to the release point, then rotates his fingers in a violent fashion, three-quarters around the ball… then drives the ball out onto the lane. Unlike contemporary power bowlers who drift leftward and realign their bodies to the target, Roth lined himself up with the target and walked toward his intended spot on the lane. The pure power game by grip and rip players is exciting but has hardly proven to be as effective as those who resort to the calmer type game. In the past, I have illustrated the advantages of power strokers versus pure power players. Surprisingly, power strokers deliver strike balls equally as potent as pure power bowlers but do it with far less effort and, in most cases, execute with far more accuracy. For example, here is a short list of strokers, power strokers and pure power (grip and rip) players who have been on the PBA tour at least five years and have at least four titles. The above statistics clearly reveal the superiority of strokers/power strokers. With the exception of Jason Couch, the pure power players are far less successful than those who apply less effort. Additionally, it must be noted that Amleto Monacelli, who has a decided edge over his closest pursuer in the pure power category, accumulated most of his titles PRIOR to the advent of reactive urethane balls. Amleto has undoubtedly been inhibited and practically shackled by the increased friction of today’s bowling balls. If you want to purchase a flashy “Grip it and rip it” t-shirt, it will surely attract a lot of attention. However, if you want to increase your average and gain greater attention, I strongly suggest you stroke ‘em and smoke ‘em!